5 common mold myths | MA Restoration Inc. Mold is all around us, there is no escaping it. When it comes to mold there is a lot of misinformation floating around out there. Just mentioning the word mold can send people into a state of panic. Mold can be a serious problem, but with a little common sense and the right information, you can learn how to separate the facts from the myths and make good decisions when dealing with mold in your Worcester home. With all the misinformation about mold out there, it is easy to overreact. Here are four “facts” that are overreactions to mold. This is kind of a half-truth. Bleach may kill certain kinds of mold on non-porous surfaces, however, it is not clear that bleach can kill all kinds of mold nor kill mold on porous surfaces such as wood. Research is continuing to be done on the effectiveness of bleach as a mold cleanup agent. It should be noted that using bleach to “kill” mold poses its own health risks and is not a recommended solution by EPA or OSHA. Bleach is also very corrosive and can cause further damage to your property if not used correctly. Not to mention the fact that bleach does next to nothing to mold spores that become airborne due to disturbance. Have you ever enjoyed a bleu cheese on a burger or bleu cheese dressing on a salad? Did you know that bleu cheese contains mold? Even antibiotics contain a form of mold (ever hear of penicillin?). Mold can certainly be associated with some health problems in some people, but it is not true that mold can cause health problems for all people. Mold produce allergens and some people are allergic to the allergens, but not everyone will react to the allergens caused by mold. People who have already compromised immune systems are also at a higher risk of reacting to mold spores. However, we wouldn’t suggest you play around with mold if you don’t suffer from any reactions to it. Mold is all around us, it is in the air we breathe, there is no escaping it. The problem is not that there is mold inside your home, but the amount of mold that grows quickly in the right circumstances. 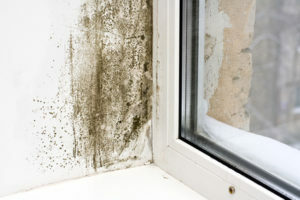 Mold should not be growing in your walls or on surfaces as that can cause significant damage to your property and home’s structure, as well as cause unpleasant odors and allergic reactions. You would think that killing the mold that was growing on your bathroom wall would end all of your mold damage problems. Unfortunately, killing mold does not remove the risk of allergic reactions to the mold, allergens are still present even if the mold is dead. The mold also has a high chance of coming back if the source of the mold growth has not been dealt with. There might be a leaking water pipe behind your bathroom wall causing the mold to grow. The best way to remove mold from your home and to keep it from damaging your property is to contact a local mold removal company, like MA Restoration in Worcester.